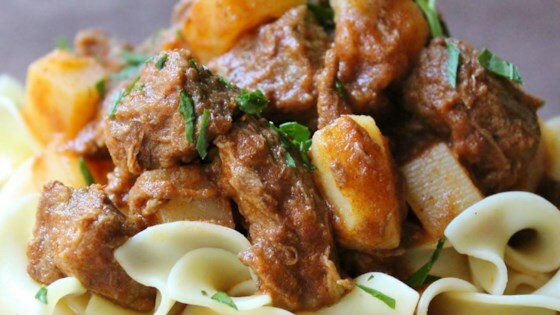 "My mother received this recipe while briefly living in Germany many years ago. A hearty stew that can easily be modified by adding veggies of your choice! I can eat this stew all year long!" Heat olive oil in a large pot over medium heat; cook and stir beef and onion in hot oil until meat is browned, about 10 minutes. Add water, tomato sauce, paprika, vinegar, Worcestershire sauce, garlic, beef bouillon, mustard, lemon juice, and bay leaf. Reduce heat, cover, and simmer over low heat until beef is very tender, 2 to 3 hours. Stir potatoes into soup and continue to simmer until potatoes are tender, about 30 minutes more. For a thicker soup, leave the pot uncovered; for a thinner soup, replace lid. Serve soup over egg noodles in bowls. I loved it. No did not make any changes.